Can Science Resurrect The American Chestnut? (WRVO) Genetically modified food is something that’s discussed a lot. But scientists in Syracuse are trying to take that technology one step further, and create the first genetically modified wild forest tree. And with that, rest hopes that the American chestnut tree could make a comeback with a scientific nudge. Chestnut trees once dominated swaths of the Eastern seaboard. That was more than a century ago, before an Asian fungus decimated a population known for delivering chestnuts to holiday revelers, and wood that doesn’t rot to builders. The fungus is now endemic throughout the Eastern U.S.
SUNY ESF Researcher Allison Oakes says when researchers found an enzyme that reduces the virulence of the fungus on chestnut trees by blocking it’s acidity, it opened the door to creating a tree that won’t die from it. So now, in a brightly lit lab in Syracuse, tiny green chestnut seedlings are tenderly cared for by Oakes. “This is going to be the first genetically modified organism that’s made for restoration of a natural ecosystem, as opposed to crop plants, or food production,” she said. 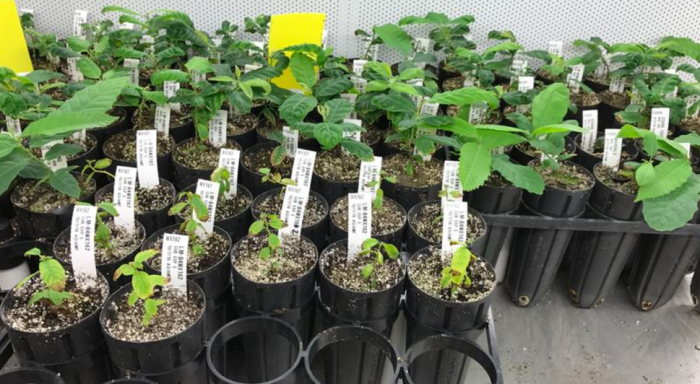 So Oakes drifts from one plant to another, pairing the fungal-resistant gene, with different chestnut seedlings. She says the long term goal is reestablishing them where they once grew with abandon. These seedlings will be planted next spring. Researchers start applying for approval from three federal agencies next year, and if they get the okay, trees could be growing in the wild in three to five year. “We’ve got to clear all the hurdles, we have to make all the studies. We’ve got to check for all the environmental safety issues. Because we can’t put anything out there that would have a harmful effect, because that’s absolutely the opposite of what we want to do,” said Oakes. She says research like this is happening with other non-crop plants and organisms, notably ash trees and coral. And she believes it’s necessary in a warming world, where it might take 100,000 years for a species like the American chestnut to reestablish itself on its own.